A creamy and comforting risotto recipe with simple, but bold, flavours. This Courgette Risotto with Parma Ham is special enough to impress a dinner date, but also an easy weeknight meal. A great way to use up a glut of courgettes and topped with delicious Parma ham. We have SO many courgettes at the moment, they are literally taking over the garden. But there are worse problems to have. They are so easy to add to a pasta or risotto to give it a veggie boost, and also bulk it out. We kept the flavours really simple and added some lemon and rosemary and then topped with some parmesan and Parma Ham – the saltiness pairs perfectly with the sweetness of home grown courgettes. We got a guided tour from a passionate ‘Ham Master’ who talked us through the process of making this unique product. The pigs used in the production of Parma Ham must be bred in one of ten northern and central Italian regions. Only three breeds of pigs can be used for Parma Ham: Large White, Landrace and Duroc. Also, Parma Ham only comes from the rear pig leg. Parma Ham is known for the delicious saltiness of the product and salting is a vital part of the curing process. When it comes to the salting process, there is no “one size fits all” approach and the ‘Salt Master’ must decide just how much salt is required. The same uniqueness is applied to the airing process as well. The air crosses the Apennines where it loses its saltiness and dries. It takes on the perfumes of the vegetation it passes through, before it reaches the production area in the hills south of Parma. This is what gives the ham its unparalleled sweetness. After air drying, the ham is moved to the cellar to start the maturation process. It is checked after twelve months with a long horse bone needle to assess its quality and maturity. This courgette risotto is so creamy and comforting – it tastes far more indulgent than it actually is. We stirred some half fat creme fraiche through and then the shaved parmesan on top gives it some extra creaminess. If you are not a fan of courgette, you could swap it for aubergine instead, but I would roast that first to really bring out the flavour. You could even using pumpkin or butternut squash for an autumnal twist. Risotto isn’t the best dish to reheat, as it dried up quite a lot when it is in the fridge, but it is possible. Make sure the risotto has come to room temperature, then put it in a pan with a little stock and gently heat until it has heated and absorbed the stock. Adding a little butter will help too. One: Heat the oil in a large pan and then add the garlic, shallots, celery and rosemary and gently cook for 3 minutes. Two: Add the risotto rice and cook for 1 minute. Three: Add the courgette, stir and cook for a further 1 minute. Four: Pour the wine, lemon juice and a ladle of the stock in to the pan and gently simmer until the liquid is nearly gone. Keep adding ladles of stock one at a time and letting it reduce until you have used the stock and the rice is cooked – this will take around 30-35 minutes. Five: Stir the creme fraiche in to the risotto and then spoon in to a bowl. Top with Parma Ham, Parmesan and pine nuts. Try chopping the Parma Ham up and frying it for a minute to sprinkle crispy Parma Ham on top of your courgette risotto. You can use any cold leftovers to make arancini. If you don’t want to use white wine, you can just swap it for the same amount of vegetable stock. Swap the courgette with aubergine, pumpkin or butternut squash for a seasonal twist. For even more creaminess in this risotto, add the rind of the parmesan to the pan and take out just before serving. 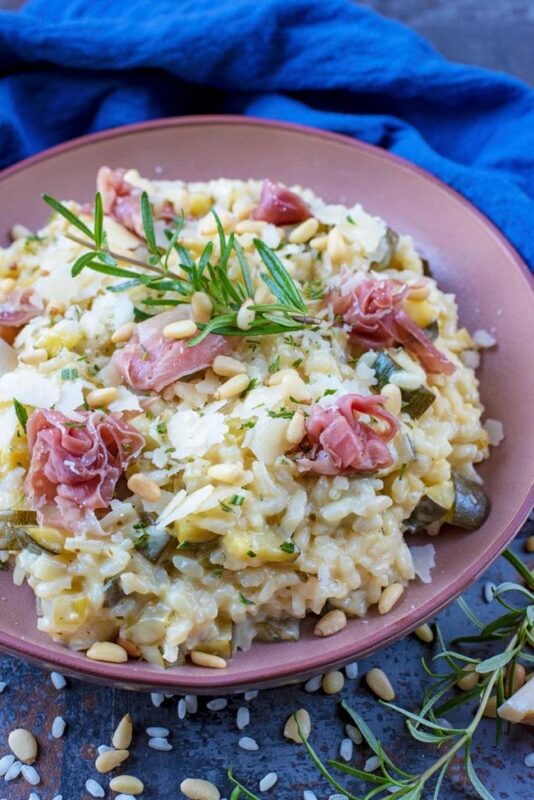 Do you want to be kept up to date on more delicious posts like this Courgette Risotto with Parma Ham? Please subscribe to the blog mailing list (it takes 30 seconds). 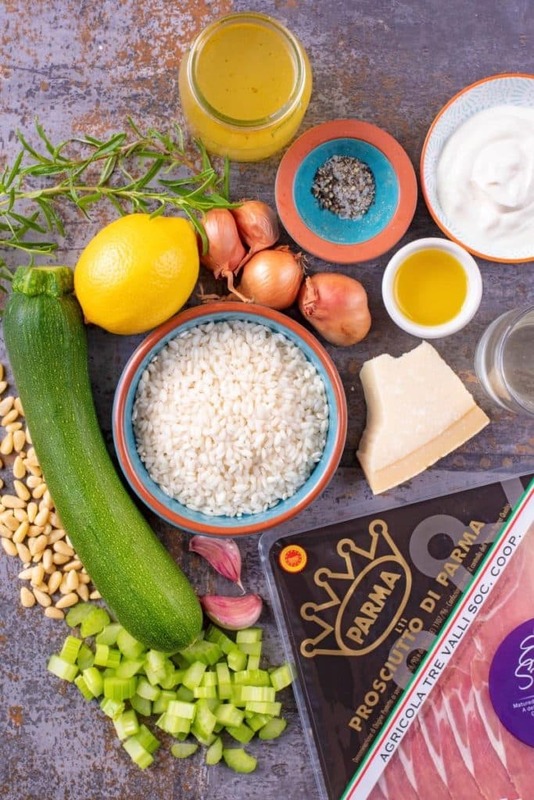 If you’ve tried this Courgette Risotto with Parma Ham, or any other recipe on the blog, then let us know how you got on in the comments below, we love hearing from you! You can also FOLLOW US on FACEBOOK, TWITTER, INSTAGRAM and PINTEREST to see more delicious recipe ideas, behind the scenes shots and also what we are getting up to. Heat the oil in a large pan and then add the garlic, shallots, celery and rosemary and gently cook for 3 minutes. Add the risotto rice and cook for 1 minute. Add the courgette, stir and cook for a further 1 minute. Pour the wine, lemon juice and a ladle of the stock in to the pan and gently simmer until the liquid is nearly gone. Keep adding ladles of stock one at a time and letting it reduce until you have used the stock and the rice is cooked - this will take around 30-35 minutes. Stir the creme fraiche into the risotto and then spoon in to a bowl. 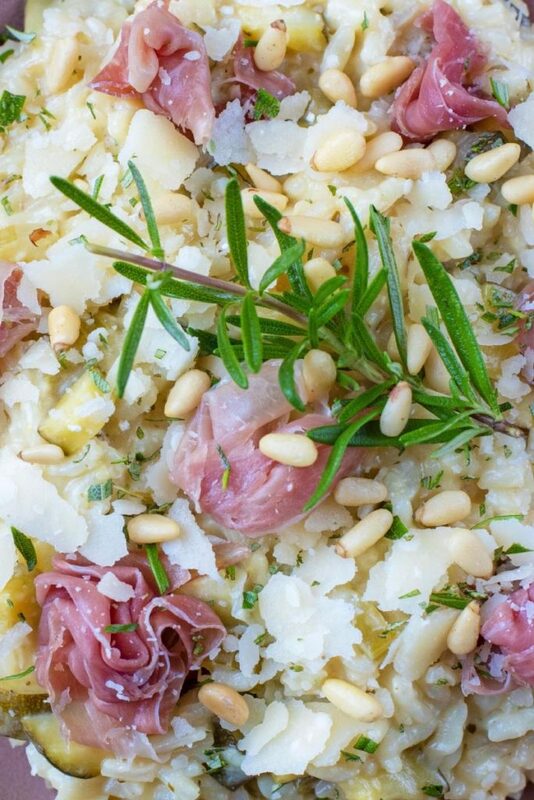 Top with Parma Ham, Parmesan and pine nuts. If you don't want to use white wine, you can just swap it for the same amount of vegetable stock. budget as well as serves the aim. Such a comforting and inviting dish. 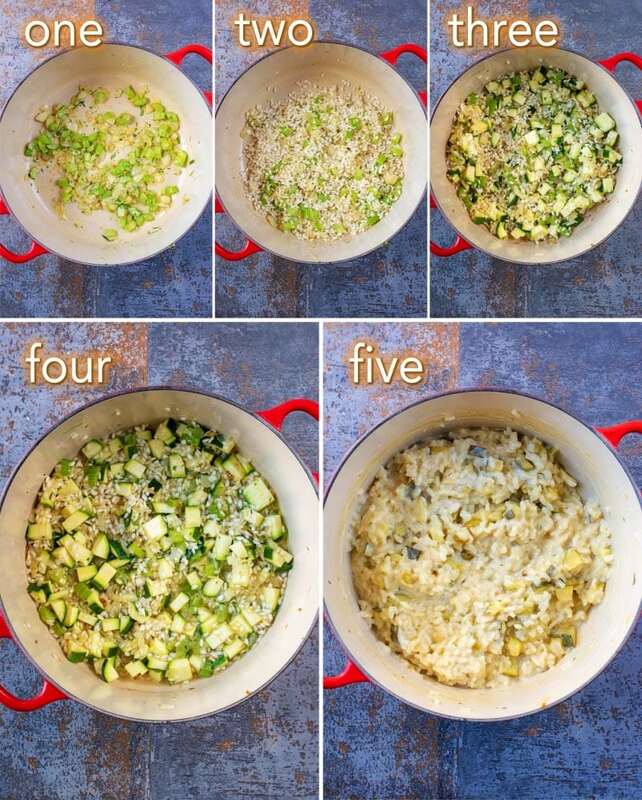 I often order risotto in restaurants but this step by step recipe is making me try at home. The bold flavors are very intriguing too. I absolutely love risotto it’s one of my favourite comfort foods. This looks delicious! This looks delicious. I have seen Parma ham in the stores but haven’t tried it. Definitely going to be on the lookout because this is a recipe I would love to serve. Wow! Not only does this dish sound amazing but your presentation of the dish is amazing! I have to try this! Yum, I love a proper Italian risotto. The creme fraiche sounds like it adds a great extra twist. And it was fascinating learning about parma ham, I had no idea it had to mature for so long! 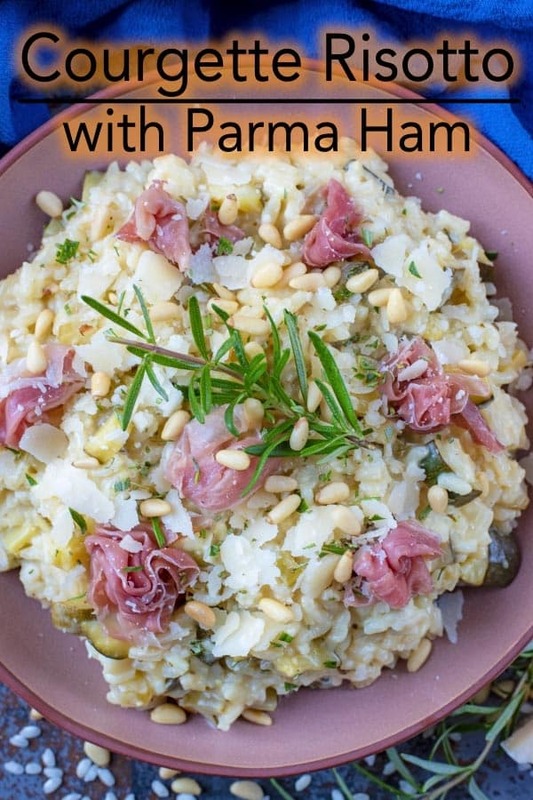 I absolutely love risotto and that parma ham sounds just divine. Loving this recipe! 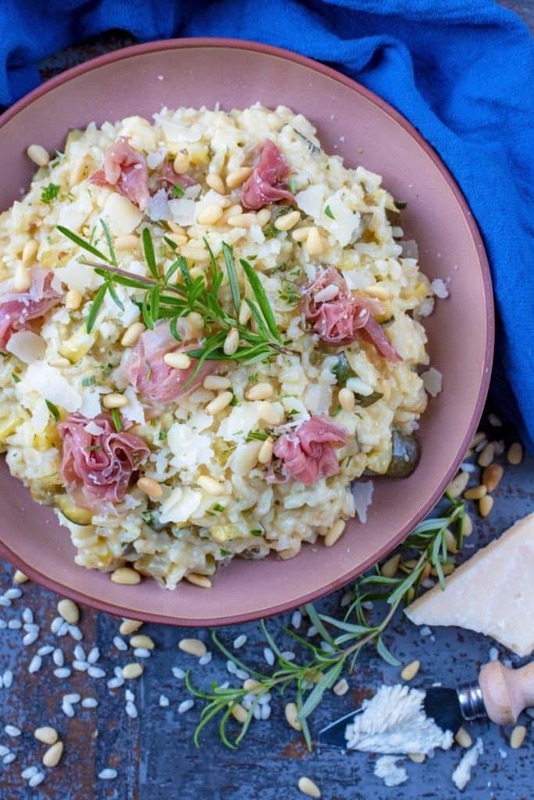 I love risotto and this one looks perfect with the addition of parma ham! This looks like my kind of dinner recipe! Love the looks of that Parma Ham! 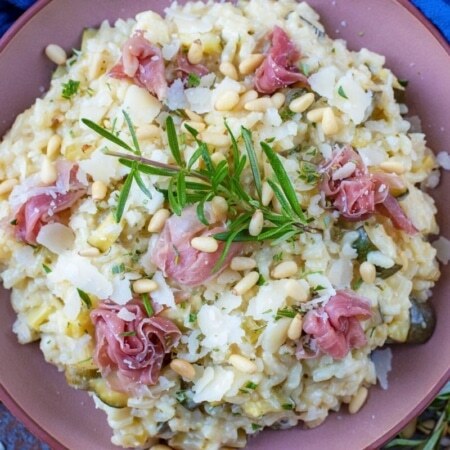 Oh I love a risotto that has white wine and pine nuts!! This is great for a comforting meal and would make my belly full. Yummo, good work! 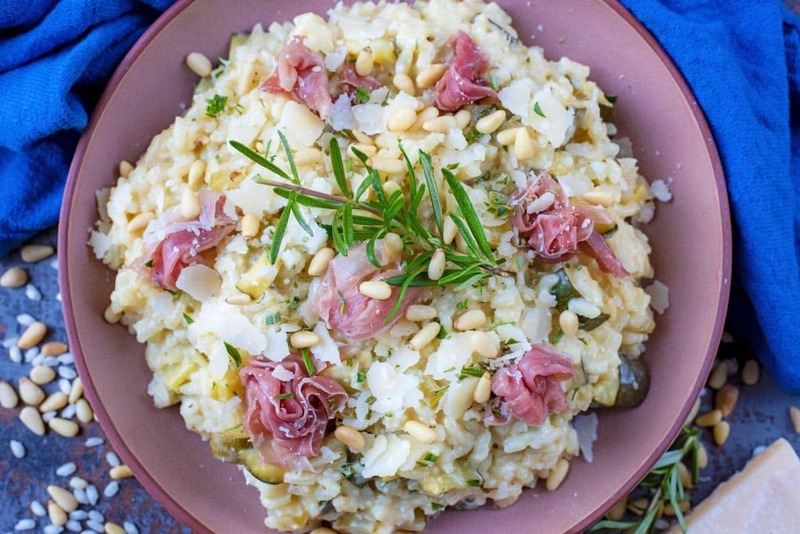 I love the addition of parma ham to this risotto – sounds so delicious! Our neighbours grow courgettes in their garden and we have been helping them throughout the summer to eat their abundant crop. I’ll share this recipe with them! This recipe looks so delicious. I have never prepared a risotto before. I am going to try your recipe soon. I love how well you have explained it.